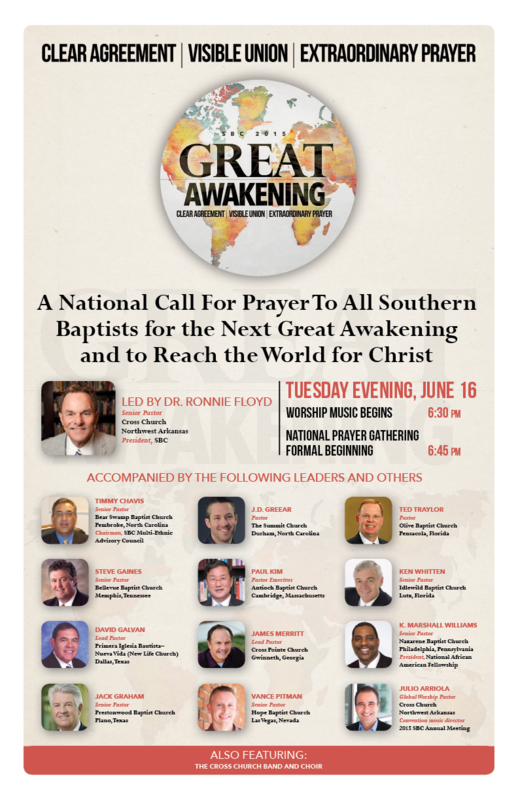 Floyd has titled the session, "A National Call for Prayer to All Southern Baptists for the Next Great Awakening and to Reach the World for Christ" on the opening night of the June 16-17 SBC annual meeting. "We will join together in the same room and around the world via technology for this one epic night of prayer," Floyd wrote April 13 in his SBC President's Page column. Two former SBC presidents, Jack Graham and James Merritt, will be among the evening's leaders. Graham is senior pastor of the Dallas-area Prestonwood Baptist Church; Merritt is lead pastor of the Atlanta-area Cross Pointe Church. "We will gather to experience the presence of God based upon the Word of God. We will be challenged briefly by some of America's great pastors, then launch into prayer sessions in response to God and His Word. We will also express our worship and praise to God together through music and singing." Floyd also noted, "One of the unique moments of the evening will be when we embrace and celebrate our ethnic diversity, which may also involve moments of repentance and reconciliation. Each of us needs to be in this experience together, letting God do a powerful work in each of our lives and churches. Southern Baptists must lead the way in embracing and celebrating our ethnic diversity." Encouraging messengers to shift their plans for dinner and fellowship in order to be in attendance, Floyd urged, "Please let nothing keep you from this extraordinary night of prayer together." He also noted, "If you live within driving distance of Columbus, Ohio, and can't attend the entire conference, at least come for Tuesday night." The overall theme for the two-day annual meeting in Columbus is "Great Awakening: Clear Agreement, Visible Union, Extraordinary Prayer." In addition to Graham and Merritt, other leaders (in alphabetical order) scheduled for the session are Timmy Chavis, senior pastor of Bear Swamp Baptist Church in Pembroke, N.C., and chairman of the SBC Multi-Ethnic Advisory Council; Steve Gaines, senior pastor of the Memphis-area Bellevue Baptist Church; David Galvan, lead pastor of Primera Iglesia Bautista - Nueva Vida in Dallas; J.D. Greear, pastor of The Summit Church in Durham, N.C.; Paul Kim, pastor emeritus of Antioch Baptist Church in Cambridge, Mass. ; Vance Pittman, senior pastor of Hope Baptist Church in Las Vegas; Ted Traylor, pastor of Olive Baptist Church in Penscola, Fla.; Ken Whitten, senior pastor of Idlewild Baptist Church in Lutz, Fla.; and K. Marshall Williams, pastor of Nazarene Baptist Church in Philadelphia and president of the Natiional African American Fellowship. For a poster-type image relating to the Tuesday prayer session, click here.